We’ve found this remarkable perennial to be perfectly hardy in our climate and it offers several outstanding features. Columns of overlapping cupped pink flowers are profuse and as they age they take on ghostly blue tints. The effect is greater in hot weather and gives this spreading perennial bicolor pink/pale blue flowers for months. To 18″ tall and steadily spreading to more than one foot wide in time. Rich, well drained soil with regular summer water is ideal, but we’ve noted its stellar performance in un-amended clay as well. Blooms continuously for months beginning in May and if the flowers become tired it may be sheared, watered well, and perhaps given a little all purpose fertilizer to start the show again. Winter deciduous. Excels in containers. Excellent on slopes, the front of borders, rock gardens, hell strips. 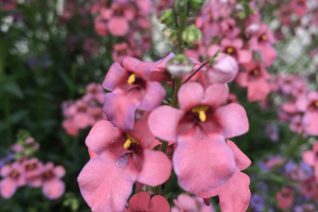 Ethereal flowers combine deliciously with variegated moor grass (Molinia caerulea ‘Variegata’) and deep purple Penstemon ‘Enor’ for similar cultural requirements and a season long display.